This is the first visit of the harmony duo Hissyfit. 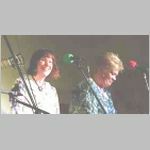 Hazel Richings and Linda Kelly are based near Hull and began singing together about 10 years ago. Linda, as newcomer on the folk scene, had begun to write songs as well as collect stories about the lives of the people involved in the fishing industry around the Humber. These have been added to their repertoire. They are delighted that their songs have been recorded and sung by Grace Notes and Pint and Dale.